Leading Manufacturer of brass hooks from Aligarh. As one of the renowned manufacturers and suppliers we offer our clients a designer array of Hooks which are manufactured as per the international standards. We procure our raw materials from certified vendors and ensure our clients for the long service life and polish of our Hooks. These Hooks find their wide application in various malls, shops and commercial areas for hanging heavy weighted bags, purses, hats and other allied products. 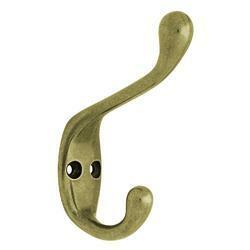 Our Hooks are widely known for its durability, reliability, perfect finish and long service life. Looking for Brass Hooks ?